The 2019 Festival will be held on September 28 and 29. 2019 Artist Application Packet is now available. If you have an inquiry related to Artists at the Festival, other than concerning participation in the 2019 Festival, you may submit it using the form at the bottom of the page. The North Quabbin Garlic and Arts Festival Mission Statement – Please bear in mind what we are striving to do for the region which includes Handmade, Homegrown, and High Quality. This is a regional festival, so we only generally only accept applications from artists who live in the North Quabbin area. The nine North Quabbin towns that will be represented at the festival are New Salem, Wendell, Erving, Orange, Athol, Warwick, Royalston, Phillipston and Petersham. If there are still spaces to be filled, artists may be accepted from a defined surrounding area 15 miles from the site of the festival (North= NH border, East=Templeton, South=Pelham, West=Greenfield). Remember that everything sold must be handmade by the artist who must be present in the booth during the festival. However, you can still apply if you live/work out of this region. “Friends of the Festival” are invited to apply: Continuing the tradition begun in 2015, the organizing committee accepts applications to jury a select few artisans to participate as a one-time “Artist Friend of the Festival”. An Artist Friend demonstrates high quality work, a strong community spirit, and creates their work in a generally under-served area outside of the festival’s represented Quabbin region. These guest artists will be invited based on space availability, jury scores, and demonstration of festival values. Applicants are encouraged to participate in the festival’s demonstration offerings and will be juried alongside other applicants of the same medium with priority going to North Quabbin area artists. If you have been a Friend of the Festival in the past, please note that it is a one-time opportunity as there are many other artists who apply for these spots year after year. Sustainable Volunteer Model: As part of your acceptance into the festival, you will be asked to contribute 4 hours of volunteer work during the summer leading up to the festival or during the days just before and after. This model has kept booth fees low and assists with successful festivals year after year. Upon acceptance, you will receive an online link to sign up for your contribution task. There are many various tasks including raising tents, assisting with recycling, cleaning tables, and painting signs. If you plan to apply, make sure to read the exhibitor participation sheet that is part of the application packet. Your submitted application means you understand this arrangement, you will not receive a booth number if you do not sign up for a task, and you will not be asked back the following year if you do not complete your task. “Art is to the soul what garlic is to the palate.” Just as garlic spices our daily food, art and craft spice our daily life. This festival brings together handmade treasures from the North Quabbin region: people working in workshops and studios making beautifully crafted things by hand. Some are professionals who travel all over to sell their work in galleries and festivals. Others feel the need to create after their “day jobs” are over, and some enjoy only selling their work at the festival each year. The festival is the place to meet many of the artists and craftspeople of our region, and to enjoy conversations and demonstrations with people who love to create. The Alchemy Studio – Mark Lattanzi – Montague, MA – Mark Lattanzi of The Alchemy Studio has been making silver jewelry for over 15 years. His work incorporates natural textures, semi-precious stones and touches of gold. Art Bug Illustrations – Chaldea Deyman – Greenfield, MA – Art Bug Illustrations makes original, handmade art for children and adults, inspired by family, music, farming, and travel. Atu House – M.M.Meleen – Barre, MA – Atu House specializes in esoteric themed art, limited edition hand constructed tarot cards, and fully researched guidebooks. Beezart Dolls – Belinda Lyons Zucker – Turners Falls, MA – Ms. Lyons Zucker began her art career as a painter/sculptor studying at Boston Museum School and Kaji Aso Studio in Boston. Presently, she is a doll maker articulating the human figure with cloth and clay to create one-of-a-kind figures. Bouncing Bet Soapworks – Vicky Sandiford – Athol, MA – Bouncing Bet Soapworks aims to provide soap and other bath products made from simple, natural, herbal, and organic ingredients. They have many unscented as well as essential oil scented products. The Bower Studio – Vincent Frano & Isa Wang- Pelham, MA –The Bower Studio is the collaborative effort of Isa Wang and Vincent Franco who create illustrated stationary and gifts. Their work is inspired by nature, including the flora and fauna of New England. Branch & Beak – Sheena P. – Montague, MA –Spellcraft & magical herbalism and modern witchraft = practical spiritual tools for the modern witch. Muggles Welcome! Bula Jean’s Boutique – Belchertown, MA – Andrea runs Bula Jean’s Boutique out of her home studio in Belchertown, MA. Using repurposed materials, she creates earth-friendly functional products for the littlest tree huggers. Cara Finch Fine Art – Greenfield, MA –Cara’s love of nature is a dominant theme in her artwork expressing her belief that the spriritual can be connected to us through the great outdoors. Casey Williams Artist – Casey Williams – Athol, MA – Casey Williams work ranges from handpainted tiny stones to larger abstract/Mod paintings on wood burlap or canvas. She is most known in the North Quabbin region for her illustrated town maps. Cricket on the Hearth Handweaving – Dvora Cohen – Wendell, MA – Dvora is a handweaver and fiber artist living in Wendell. Her scarves, shawls and simple clothing are made from new and relaimed fibers, some handspun, hand dyed or home grown. Deborah Bazer Clayworks – Deborah Bazer – Lake Pleasant, MA – Deborah joyfully creates hand-built, raised relief tile, flowerpots, dinnerwarae and sculpture for home and garden. Her work is inspired by folklore, mythology and the beauty of the natural world. Dragonfly Designs – Melinda LeLacheur – Shutesbury, MA – Creating for health and happiness, Dragonfly Designs uses fabric, beads and wire to create natural therapy pillows, bags, stuffed animals, beaded bugs, and more. We dearly love playing with texture, pattern, and color, combining the unexpected to make something delightful. Evans Country Clean – Northfield, MA – Evans Country Clean crafts homemade soaps and body scrubs using healthy ingredients. Honeymoon Hill Bees – Colleen Seamon – Phillipston, MA – Beeswax skincare products, handmade in Phillipston with beeswax food wraps. John Bander – Turner’s Falls, MA – Jon Bander is a weld tuned artist with a passion for detail and creativity. Joy Friedman Pottery – Joy Friedman – Leverett, MA – Joy Friedman has been a professional potter for 30 years. She makes functional, colorful stoneware for kitchen and home use. Laureen Shea – Leverett, MA – Laureen Shea lives and works in Leverett, MA and enjoys painting in her free time as it makes her smile. Watercolor brings her joy as nothing else…well maybe chocolate! Lydia Grey – Orange, MA – Lydia’s pots are shaped by hand and are meant to be held and touched. Each piece is finished by polishing with terra sigillata, or coated with a copper stain, bisqued and smoke fired or with high-fire glazes. Moon and Sundries – Karen Ducey – Shutesbury, MA – Colorful gifts and accessories for the delightfully eclectic, handcrafted by Karen Ducey. Mulholland Silk Screen – Susan B. Mulholland – Leverett, MA – Susan Mulholland has been silkscreening since 1973. Her work includes note cards, tee-shirts, silk scarves, and table linens, all hand screen in her Leverett studio. New England Fiber Arts – Sandra Tobin – New Salem, MA – Sandy is a versatile fiber artist who’s work includes reversible aprons and bibs, quilted tote bags and purses, coiled fabric bowls and coasters, patwork hotpads, and more. The hallmark of her work is fine workmanship coupled with fun and colorful fabrics that play well together. North Quabbin Photography – Dale Monette – New Salem, MA – Wildlife and scenic photos from around the Quabbin covering the four seasons. Nova Luxe Studios – Tiffany DeAngelo – Southampton, MA – After spending nearly 20 years in the hotel industry, Tiffany made the break to follow her love of hand crafting items. Since she had been taught wire wrapping by her grandmother and a passion for the outdoors, her trees began. 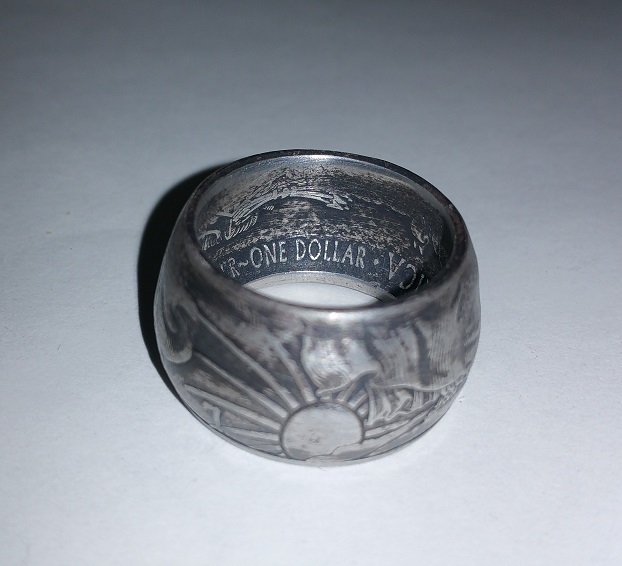 Rings of Change – James Payne – Athol, MA – James Payne is an engineer by training who likes to work with his hands and create rings out of old coins. Simple Shoemaking – Sharon Raymond – Shutesbury, MA – Sharon Raymond uses leather upholstery remnants and innter tubes to make ecological footwear for children and adults. Snow Flake Mittens – Lettie Posk & Rae Kramer – Athol, MA – Lettie and Rae have been recycling wool sweaters into fleece-lined mittens for ten years. Spoon River Jewelry – Deva and Trish Casimira- Wendell, MA – Antique silver-plate silverware redesigned into wind chimes, earrings, spoon rings, spoon bracelets, and other accessories. Stillwater Flutes, Standing Bear Drums, Windsong Herbal – Larry ‘Windsong Healer’ Anderson and Michael Longrider – Orange, MA – Larry and Michael craft Native American style flutes and drums from 10″ up to 50″ in diameter. Michael is a Native American Music award winner. Swift River Glass – Ina Peebles – Wendell, MA – Swift River Glass creates beautiful dichrotic glass, sterling silver, and bronze jewelry. Often, semi-precious stones and resin enamel are added to her creations. designs. Taproot Arts and Insight – Valerie Gilman – Shutesbury, MA – Val Gilman is a potter and sculptor as well as a life coach and she teaches clay classes from her home studio. Turn, Turn, Turn – Sam Scherer – Orange, MA – Sam Scherer offers a variety of wooden bowls, plates, tops, yoyos, hollow form vessels, and burls turned on a lathe, all made from maple, birch, oak, cherry, beech, and other woods. WEAVING ARTcetera – Adele Smith-Penniman – Wendell, MA – Wendell fiber artist Adele Smith-Penniman’s craft ranges from colorful batik silk scarves to handwoven wall hangings and bags. She is also known for her fabric notecards and journal covers, handpainted or sewn using batik and patchwork fabrics. Wee Things Fiber Arts – Rachel Beaupré – Montague, MA – Artist Rachel Beaupré opened the Wee Things Fiber Arts studio in 2014 inspired by her children’s endless curiosity with the natural world. Using 100% natural materials, Rachel creates eco-friendly, heirloom quality toys and soft sculptures that celebrate our natural environment. Whistling Sparrow Designs – Libby Meehan – Whately, MA – Libby is an eco-friendly artist creating and living in Whately. She makes stitched greeting cards using vintage ephemera and bohemian upcycled women’s clothing and accessories. Wild Child Tye Dyes – Jodi Levine – Pelham, MA – Jodi has been playing with color on fabric since 1989, creating bright, vibrant tie dyes for the whole family. She uses only sweatshop-free garments, many organic cotton, and environmentally friendly dyes for colorful clothes that last and last while not harming the earth or its people. 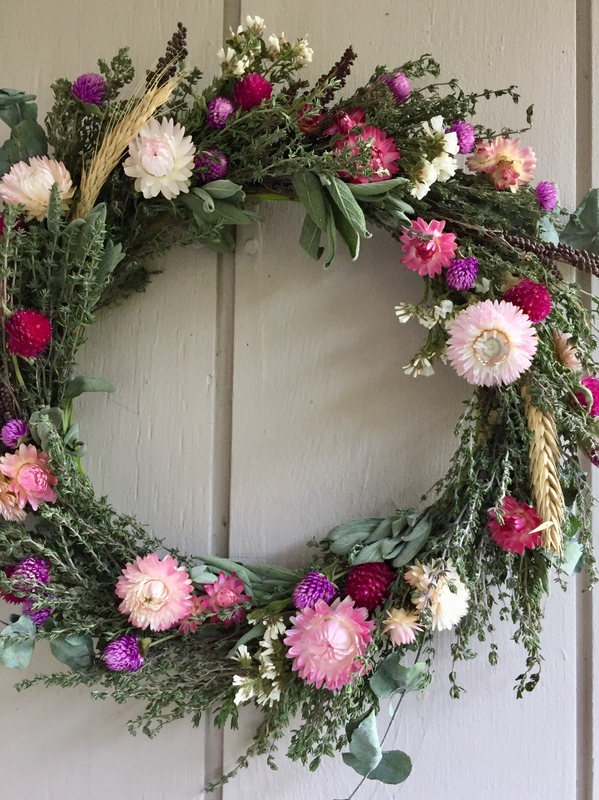 Wild Edge Floral – Kate Stafford – Greenfield, MA – Wild Edge Floral creates wreaths and other botanical decor from locally and ethically gathered plants. Each piece is uniquely beautiful, long lasting, and a celebration of our local flora. Wyrd Sisters – Elizabeth Smith & Heather Clark – Millers Falls, MA – Wyrd Sisters is the informal name for the creative partnership between Elizabeth Smith and Heather (Morgan) Clark. They have been friends for over 20 years, have worked together since 1996, and although they each have their own style and favored mediums, they are constantly sharing ideas, thoughts, design possibilities, new creative endeavors, and from time to time studio space. If you’d like to inquire about anything artist related, please fill out this form and Diane Nassif or Lou Leelyn, Artist Coordinators for the Festival Organizing Committee, will get back to you as soon as possible.